Using a Predictive Analysis Model, this document helps political party strategists, active citizens and development organizations identify emerging trends in Nigeria’s political climate that will influence voter behavior and ultimately the sub-national voting patterns in Nigeria’s 2019 governorship election cycle. It helps all stakeholders concentrate scarce resources on the right activities. Six states (6) will emerge as battleground states — these are states in which incumbent governors face a higher chance of being unseated or in which the ruling party faces a real risk of being removed. In developing a predictive model for Nigeria’s 2019 governorship elections, we utilized statistical principles similar to those that have been used to accurately predict outcomes of United States elections since 1912 by the likes of Moody Analytics and Prof. Helmut Norpoth of Stony Brook University, United States — whose statistical model was one of the few to correctly predict a Donald Trump victory against all odds. However, to improve the accuracy of our model in Nigeria, we factored in local context, voter behavior and voter susceptibilities. Using data for subnational poverty rates as one of our 7 predictors, our model was able to profile areas where voters will be more susceptible to “rice & tomatoes” politics; i.e. voting for a fee on election day; data for sub-national literacy rate was used to identify areas where voters are more likely to understand the complex issues affecting them and evaluate candidates based on the quality of strategies expressed in their manifestos to address these issues. Other predictors used to train our predictive model include victory margin of the incumbent in the last election cycle, historical voter apathy, existence of a policy crises (i.e. policy actions or inactions that directly affect food, shelter, security and taxes of the poor and middle class), outputs from our sentiment analysis and lastly opposition vibrancy in each state. All ruling parties at the sub national level in Nigeria practice “State capture” — which is the subtle conversion of public resources for private gain of the political class in power. This was factored in when considering Nigerian states where incumbent political parties would likely retain their states irrespective of the existence of opposition party candidates with better governance plans especially in states with the highest multidimensional poverty rates. In these poor states, voters will generally vote for party candidates who pay them the highest or offer them food on or before election day — paradoxically, the highest paying candidates will be those benefitting from and perpetuating state capture of public resources to the further detriment of the poor. States that will lean APC in 2019 governorship elections have the highest poverty rate and sadly, the lowest literacy rates in the country. 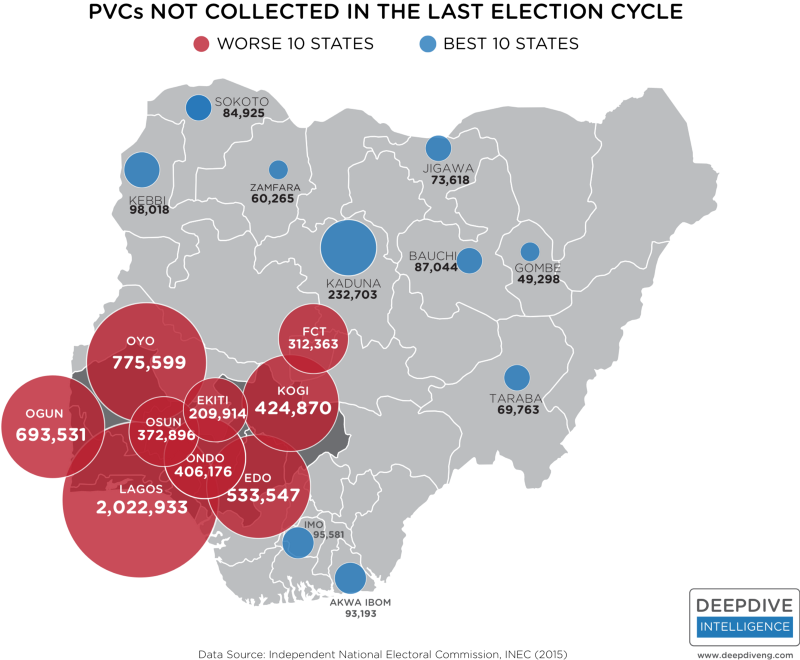 These multidimensionally poor states also have some of the highest PVC collection rates (meaning the lowest number of uncollected PVCs) in the country. Several reasons can be adduced for this, perhaps, it may be because many voters in these regions see it as their meal ticket or voters in the North are more politically aware or even worse, there may be a subtle form of state capture that allocates more resources for PVC collection to certain areas in the country than others. See infographic for Top 10 States with highest PVC collection rate in 2015. The Battleground States have some of the highest Adult literacy rates in the country (with the exception of Jigawa State). These states also have some of the lowest poverty rates (with the exception of Jigawa and Taraba) which were included in the battle ground states because of 4 criteria; less than 20% victory margin of the incumbent party in the last election cycle, vibrant opposition, sentiment against the ruling party at the center and the presence of policy crisis. For the 14 Nigerian states that will lean APC or PDP; National Institute for Policy and Strategic Studies, NIPSS, international development organizations, democracy institutes and European Union need to support projects and dialogues aimed at promoting internal democracy in those parties at the gubernatorial levels because the winner will most likely emerge from the political parties as predicted above. This is not to suggest the complete abandonment of all the other parties in this state, it’s a guide for stakeholders to prioritize scarce resources. For battleground states; INEC, National Institute for Policy and Strategic Studies, NIPSS, Election monitoring groups and international development organizations and need to focus resources on voter education, preventing electoral malpractices, and averting subtle voter suppression in these battleground states. Projects and dialogues aimed at promoting internal democracy for all political parties should be embarked on in these states. 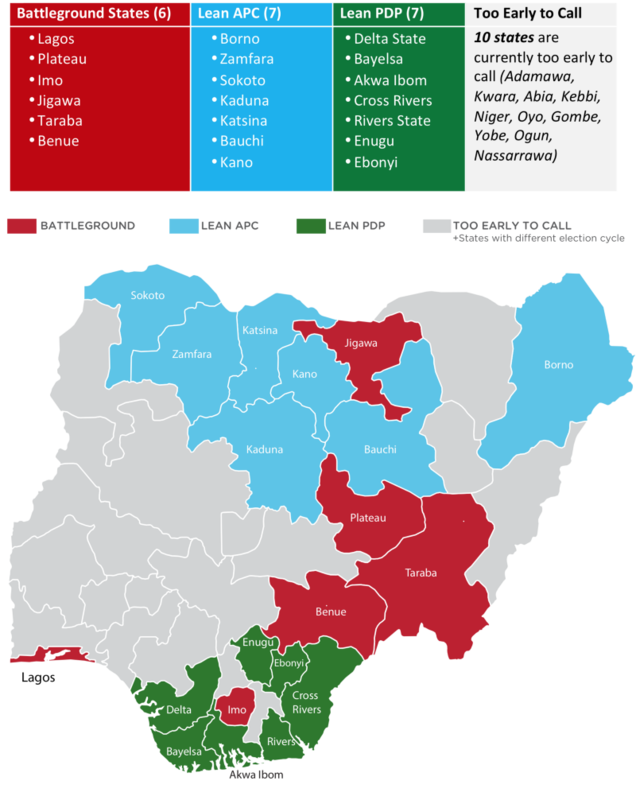 Lastly, all stakeholders need to commence pre-election peace dialogue early in battleground states as these could be potential flash points for violence in Nigeria’s 2019 governorship elections if there are perceptions of foul play; these peace dialogues are important to prevent pre and post election violence.